Okay, so maybe I won’t become a yoga master and achieve the secret skill of levitation like in the Sims, but Housewife Challenge #3 is to get back into shape and to start doing yoga on a regular basis again. While I was pregnant, I discovered yoga at the suggestion of my friend Laura, who might just be a yoga master herself. I found the best prenatal yoga class with a great teacher, Marnie. The class was a fun way to meet other mamas-to-be and it really got me hooked on yoga. It’s amazing to me that something can be both exercise and relaxation all at once. Never before had l loved exercise so much; sure, I’d experienced the adrenaline haze that came with swimming lap after lap during swim team practice, but short a swim coach, I hadn’t found the motivation to really push myself in a pool since college. Besides, I truly love the spiritual, meditative aspects of yoga which make it so much more than exercise. I credit Marnie’s class with helping me to have such a zen pregnancy and birth. I loved doing yoga so much, I even did a prenatal yoga photo shoot with an amazing photographer, Melissa Surprise. Not only did her photos capture my amazing and beautiful baby belly in a fun way, but they also showcased my growing love for yoga. This was just two weeks before my (not) due date – a.k.a. four weeks before Nora was born. Once Nora was born, I took a few weeks off to recuperate (understandably), and then joined in on Marnie’s Tiny Yoga classes, which meant Nora got to come too. I even was pretty good about doing a baby and mom yoga DVD at home while on maternity leave, but once I went back to work, yoga was one of the things that went out the window in the craziness of trying to do too many things all at once. I did an occasional weekend Tiny Yoga session, but that was it. So, when we made the decision for me to stay home and the list of all the things I’ll have time to do now popped into my head, yoga was on it. But guess what? I haven’t done yoga once since moving to Nantucket. And having realized that yesterday, led to Housewife Challenge #3. I’m not worried about weight at all (more on that later this week in Housewife Challenge #4), but I’d like to tone up a bit and I’d really like to make sure I’m taking some time for inward reflection and meditation. In order for this to actually happen, though, I have to be more specific about the goal. From now until the end of August, I’m going to do at least 45 minutes of yoga twice per week. Beginning the first week of September, I’m going to increase yoga days to three per week. For now, I’ll be doing it on Sundays and Thursdays; and to put my money where my mouth is, since yesterday was Sunday, it started yesterday. 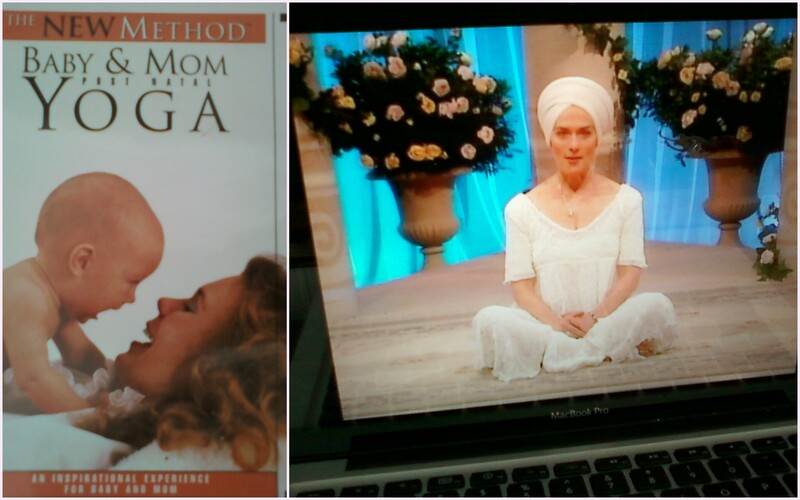 I got out my incredibly 90’s Baby and Mom DVD. Plopped Nora down with some toys, unrolled the mat, and got to it. Don’t you love my yoga mat? It’s so pretty and interesting to look at while doing all those downward-facing poses. Nora was way more into the interactive poses than she was as a newborn. She loved riding on my legs like an airplane and crawled all over me when I did anything on the floor. 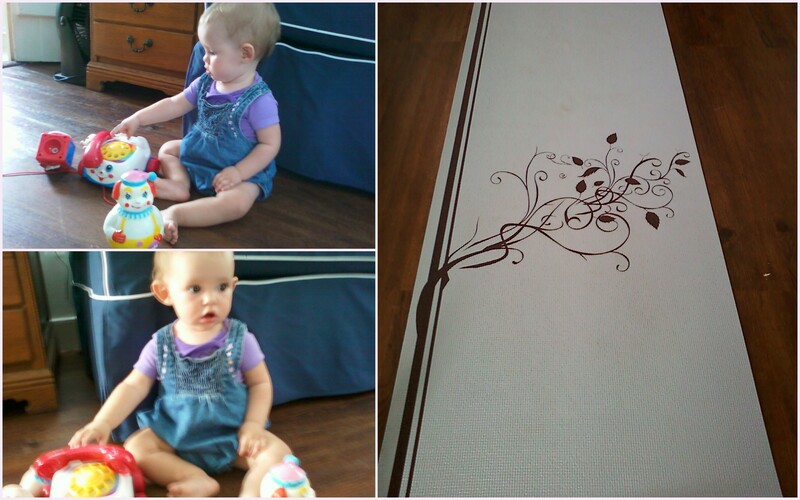 She was intrigued by all the Ohm’s and Sat-Nam’s. I even caught her in cow pose a few times. Her favorite pose, though, was Savasana, because she got to nurse, which made an interesting challenge for me in clearing my mind. 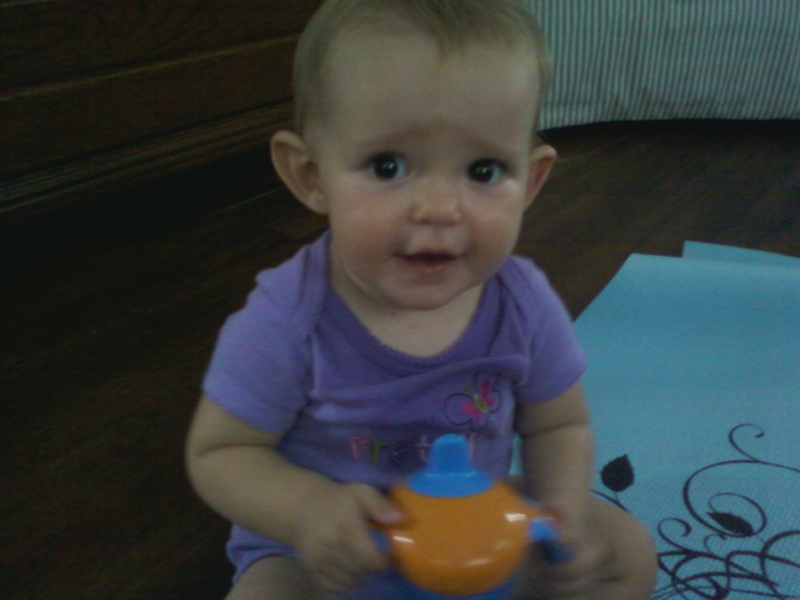 She was super on top of the whole staying-hydrated-while-exercising thing – milk and water. It was so wonderful to do yoga again, that I was chiding myself for waiting so long. But, now that I’m making a point of building it into the routine, hopefully I’ll be able to feel this good on a regular basis. Let’s just see if I’ll be able to stick to it. *sigh* i wish i was a house mommy too : ( I’ve had such a great time staying home with aria this summer. Good for you for getting back into it! Why not stop teaching for a while? I bet you could make it work.